Definition: A transient ischemic attack (TIA) or “mini-stroke” is a brief episode of neurological dysfunction caused by loss of blood flow (ischemia) in the brain, spinal cord, or retina, without tissue death (infarction). 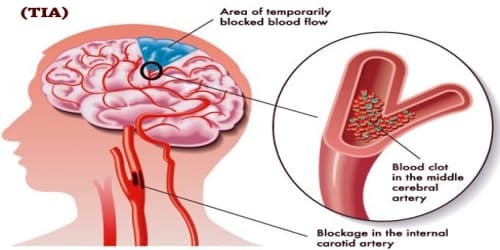 In a transient ischemic attack, unlike a stroke, the blockage is brief, and there is usually no permanent damage. The disruption in blood supply results in a lack of oxygen to the brain. This can cause sudden symptoms similar to a stroke, such as speech and visual disturbance, and numbness or weakness in the face, arms, and legs. While a TIA must by definition be associated with symptoms, a stroke may be symptomatic or silent. In a silent stroke, also known as silent cerebral infarct (SCI), there is permanent infarction present on imaging, but there are no immediately observable symptoms. 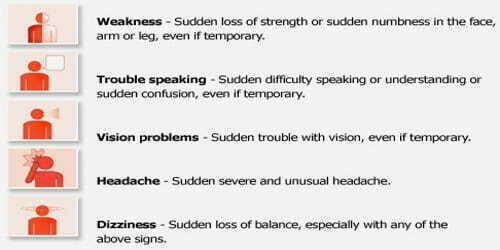 An SCI often occurs before or after a TIA or major stroke. Causes and Risk factors of TIA: TIAs typically happen because a blood clot gets lodged in an artery that supplies blood to the brain. Without regular blood flow, our brain is starved for oxygen and can’t work like it normally does. 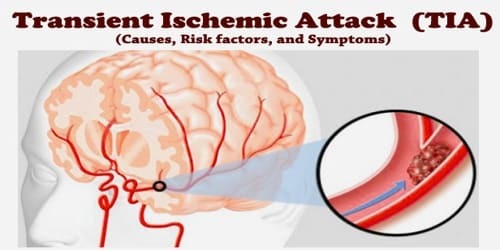 There are three major mechanisms of ischemia in the brain: embolism traveling to the brain, in situ thrombotic occlusions in the intracranial vessels supplying the parenchyma of the brain, and stenosis of vessels leading to poor perfusion secondary to flow-limiting diameter. Globally, the vessel most commonly affected is the middle cerebral artery. People over 60 years of age and people of Asian, African or Caribbean descent are also at a higher risk of having a TIA. Some risk factors for a transient ischemic attack and stroke can’t be changed. Others people can control. People can’t change the following risk factors for a transient ischemic attack and stroke. But knowing people are at risk can motivate them to change their lifestyle to reduce other risks. People can control or treat a number of factors — including certain health conditions and lifestyle choices — that increase their risk of a stroke. Symptoms such as unilateral weakness, amaurosis fugax, and double vision have higher odds of representing TIA compared to memory loss, headache, and blurred vision. People may have more than one TIA, and the recurrent signs and symptoms may be similar or different depending on which area of the brain is involved.